Is this Victoria Beckham's latest device for staying in shape? Alright, let's not all get too excited. 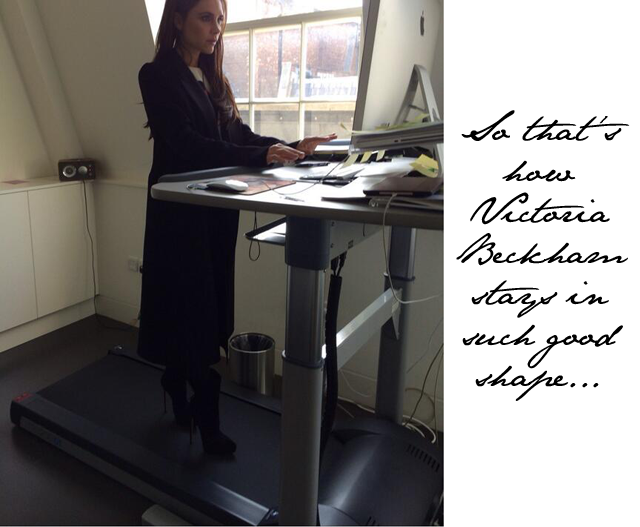 Yes, that is Victoria Beckham on a treadmill desk in London. However, we doubt that the treadmill is in action as this photo is being taken. Just check out the high heels, people. There will be no running going on there. It appears Beckham was spending some time in the office of Susie Forbes, Principal of the Conde Nast College, who is the proud owner of this hefty piece of equipment.